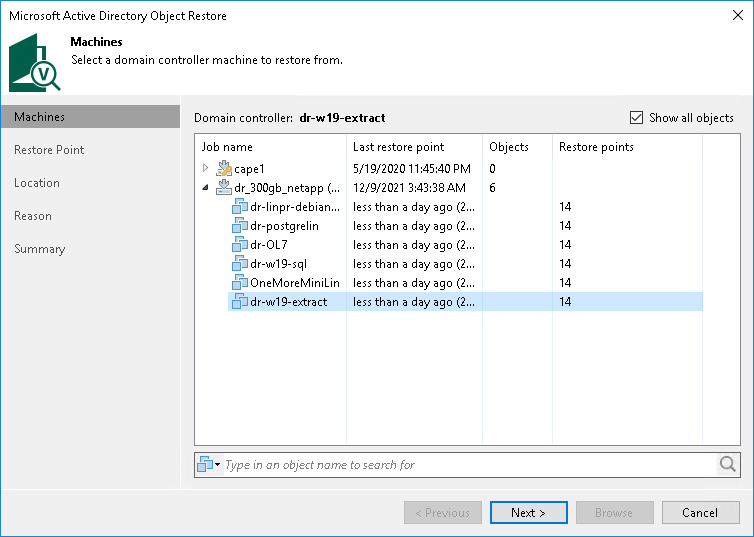 At the Machines step of the wizard, Veeam Backup & Replication displays all Microsoft Active Directory VMs whose disks are located on the storage system. Select the necessary VM from the list. If the necessary VM is not displayed in the list, select the Show all VMs check box. Veeam Backup & Replication will display all VMs whose disks are located on the storage system. To quickly find a VM, you can use the search field at the bottom of the window. Enter the VM name or a part of it and click the Start search button on the right or press [ENTER].